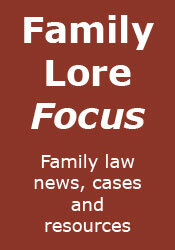 As I'm sure I've said before, many things in family law are universal. One such, it seems, is delay in deciding children disputes. Here's an idea to deal with the issue from South Carolina. So long as there are no mental illness, substance abuse or domestic violence issues, the parties can agree to take part in the program. At a fifteen minute temporary hearing, the judge will determine where the child will live as the case proceeds. The hearing also arranges mediation between the parents. If appropriate, the judge will appoint a guardian ad litem, who must report back within sixty days. The parents then go to mediation, where they are expected to settle all issues. The parties should reach a resolution within ninety days of the temporary hearing, shaving some nine months off the average time taken under the 'normal' procedure. It's an interesting idea that seems to have some merit, but its obvious weaknesses are that it is purely voluntary, and that the mediation may not be successful. Unfortunately, the main problem in long-running children disputes is the unreasonableness of one or both of the parties, and that issue is not addressed, as such parties can easily circumvent the system. All of which is obviously reminiscent of our government's reliance on mediation as a panacea to resolve all problems with our own system. For the full story, see this article in The Post and Courier, which I found via Florida Divorce.